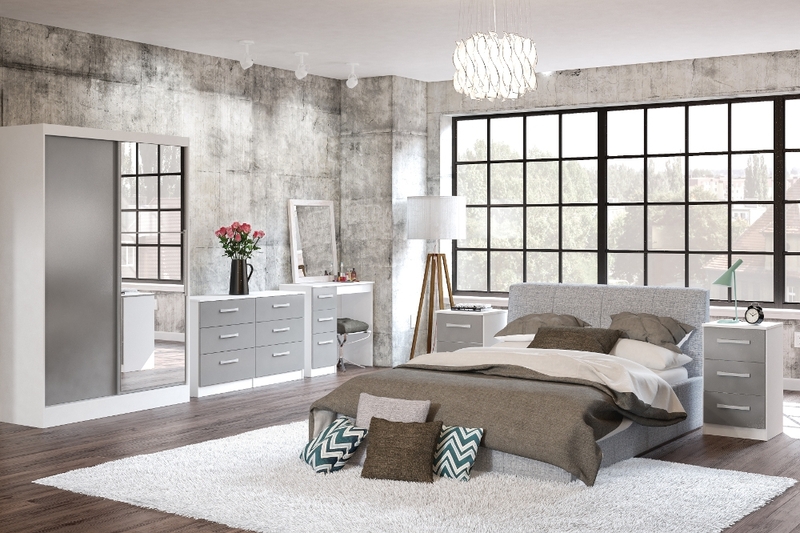 With the Lynx collection, you are bound to find the perfect bedroom furniture to match your décor, there are eight different colours available in a range of wooden and gloss colours. Some are two tone ranges, and some are all one colour giving you a large spectrum to choose from. The units are constructed from MDP(Multiple Density Particleboard) and are all finished with bold silver detailing on the handles. This collection has all the items you could need for your bedroom. The range features 5 wardrobes with a varying amount and type of storage including drawers, shelves and hanging rail space. Some of the wardrobe doors also feature full length mirrors. If space is an issue a sliding wardrobe may be a good solution as you will not need the space for the doors to open. There are three chests of drawers, a single pedestal dressing table along with a stylish 3 drawer bedside table that completes the set. The items are all delivered flat packed for ease of delivery and can be easily assembled using the instructions provided.